DMTI Satellite Streetview is an integrated product containing orthorectified and pansharperned QuickBird Satellite imagery data combined with CanMap streets data. It provides satellite imagery at 60cm along with boundary and point data. 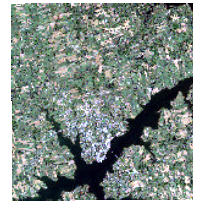 This dataset contains satellite images taken in 2009 using natural colour composite bands, covering Charlottetown, PEI. Supplementary data files and documentation are available for download from the 'Additional Documentation' section. SSV, Charlottetown, PEI, Prince Edward Island, Queens County, P.E.I. Pansharpened images taken by the Quickbird Satellite are mosaicked and orthorectified to account for differences in elevation and terrain. The Quickbird Satellite provides images in five bands, one panchromatic and four multispectral. Images are radiometrically corrected, sensor corrected and geometrically corrected with spatial mosaicking and colour balance applied.